The Innovation and Startup Summit 2019, a three-day Summit seeking smart and innovative solutions for three major problems of Banda district — Anna Pratha, water crisis and malnutrition — got underway at the Government Medical College, Banda on Monday. Organised by the Banda district administration in collaboration with Zila Vigyan Club Banda, the Summit with the tag line, ‘Let’s Innovate, Explore New Paths of Sustainable Development’, has been designed as a platform for innovators and entrepreneurs from across India to meet and interact and provide solutions to some of the most pressing issues facing the district which is part of the Bundelkhand region of Uttar Pradesh. The three-day Summit is providing a platform to innovators and start-ups to explore opportunities in Bundelkhand region, mainly in the area of agriculture, healthcare, mobility, women safety, waste management, among others. 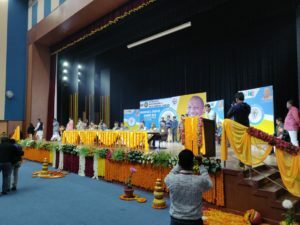 Some of the themes of the event include urban and rural development; education and educational tools, agriculture and agribusiness, medical, health and hygiene; technology for social development; and water conservation and management in the Budelkhand region. The three-day event will be full of experiential learning and networking for start-ups and aspiring entrepreneurs.